How Long of a Dynamic 3′-Deoxy-3′-[18F]fluorothymidine ([18F]FLT) PET Acquisition Is Needed for Robust Kinetic Analysis in Breast Cancer? 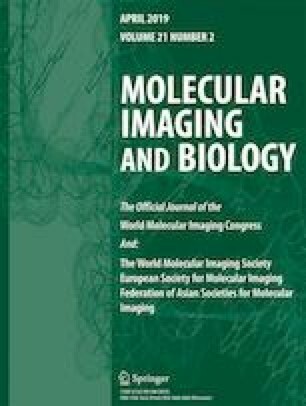 To quantitatively evaluate the minimally required scanning time of 3′-deoxy-3′-[18F]fluorothymidine ([18F]FLT) positron emission tomography (PET) dynamic acquisition for accurate kinetic assessment of the proliferation in breast cancer tumors. Within a therapeutic intervention trial, 26 breast tumors of 8 breast cancer patients were analyzed from 30-min dynamic [18F]FLT-PET acquisitions. PET/CT was acquired on a Gemini TF 64 system (Philips Healthcare) and reconstructed into 26 frames (8 × 15 s, 6 × 30 s, 5 × 1 min, 5 × 2 min, and 2 × 5 min). Maximum activity concentrations (Bq/ml) of volume of interests over tumors and plasma in descending aorta were obtained over time frames. Kinetic parameters were estimated using in-house developed software with the two-tissue three-compartment irreversible model (2TCM) (K1, k2, k3, and Ki; k4 = 0) and Patlak model (Ki) based on different acquisition durations (Td) (10, 12, 14, 16, 20, 25, and 30 min, separately). Different linear regression onset time (T0) points (1, 2, 3, 4, and 5 min) were applied in Patlak analysis. Ki of the 30-min data set was taken as the gold standard for comparison. Pearson product-moment correlation coefficient (R) of 0.9 was chosen as a limit for the correlation. The correlation of kinetic parameters between the gold standard and the abbreviated dynamic data series increased with longer Td from 10 to 30 min. k2 and k3 using 2TCM and Ki using Patlak model revealed poor correlations for dynamic PET with Td ≤ 14 min (k2: R = 0.84, 0.85, 0.86; k3: R = 0.67, 0.67, 0.67; Ki: R = 0.72, 0.78, 0.87 at Td = 10, 12, and 14 min, respectively). Excellent correlations were shown for all kinetic parameters when Td ≥ 16 min regardless of the kinetic model and T0 value (R > 0.9). This study indicates that a 16-min dynamic PET acquisition appears to be sufficient to provide accurate [18F]FLT kinetics to quantitatively assess the proliferation in breast cancer lesions. Jun Zhang and Xiaoli Liu are co-first authors and have contributed equally. The authors acknowledge the help from Preethi Subramanian M.S. for the [18F]FLT data management. This project was financially supported by NCI grant U01CA076576, Ohio Third Frontier ODSA TECH09-028, and the Wright Center of Innovation Development Fund.